Brian McGeehan has been a fly fishing guide across the Rocky Mountain region for 17 years and has spent the last 9 seasons guiding and outfitting on the Madison River and the surrounding blue ribbon rivers of Southwestern Montana. He grew up in Pennsylvania where he explored the many fine freestone and limestone streams of the keystone state. Brian McGeehan has been a professional fly fishing guide since 1995 and considers the rivers of southern Montana his home waters. Listen in to hear how to fish the Madison River - a river that will always challenge you and show you a different face at every turn. During summer long field geology class at Penn State University, Brian spent part of the summer in Montana where he caught the bug for western fly fishing. While completing a M.S. in civil engineering at the University of California at Berkeley and a M.S. in science education from Duquesne University he spent his summers guiding on the Arkansas, South Platte and Gunnison Rivers. Eventually he accepted a teaching job in Colorado where he spent several more years guiding and fishing. The appeal of the Big Sky state brought Brian and his wife Ann to Bozeman where he continues to teach middle school science while running Montana Angler Fly Fishing. He has been fishing, guiding and outfitting in Montana for nine seasons on rivers that include the Madison, Gallatin, Yellowstone, Boulder, Jefferson, Missouri, Stillwater, and Ruby. He also spends significant time fishing in nearby Yellowstone Park. Brian is an avid fly tyer and hosts a weekly fly tying club in the winter months. He also hosts a fly fishing after school program at Bozeman’s Chief Joseph Middle School where he teaches 7th grade science. His passion for fly fishing has led to destination travels that include Alaska, Ireland, Scotland, Costa Rica, Honduras, Canada, Belize, Mexico, Russia, Argentina, Chile, New Zealand and the Bahamas. His outfitting company, Montana Angler Fly Fishing, also represents several international lodges and Brian hosts groups of anglers on destination trips each season. Although Brian spends significant time guiding the traditional floats and access areas of blue ribbon rivers such as the Madison, Gallatin and Yellowstone his passion is to find off the beaten path waters to access trout that receive very little pressure. He is an accomplished class V whitewater oarsman and often applies his experience in whitewater to gain access to rugged canyon stretches of rivers that see very little angling pressure. Brian is a frequent contributor of fly fishing content for several online publications including About.com and Paflyfish.com. He is also makes regular appearances on Trout TV which features fly fishing waters across the Western US and Canada. He and his wife Ann reside in Bozeman where they are proud parents of four young children. 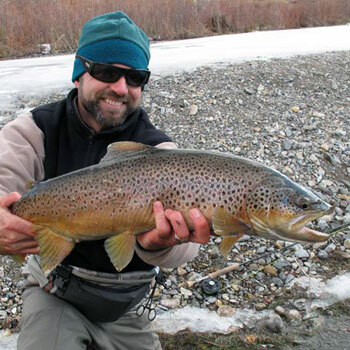 To learn more about Brian McGeehan and the guide services he offers go to: www.MontanaAngler.com.